First and foremost, let me apologize for last week’s lack of updates. A series of family matters had me away from this blog and the hobby at all, but I’m back into the fray. Doc Emmett Brown from Back to the Future movie! In fact, I was going to make this miniature anyway even before buying the Junkers starter set for Punkapocalyptic. I wanted to get those junkers, but the steampunk look they had put me away. I was wondering what to do with them, untill those good fellas from Badroll Games just uploaded their next issue of “Scrapbridge Gazette“, which is some sort of fictional gazette that the Old Ratcutter prints for the inhabitants of the Wastelands. Then I thought, what if those people that bash down Marty once he shows up with the De Lorean rainsacked the car? 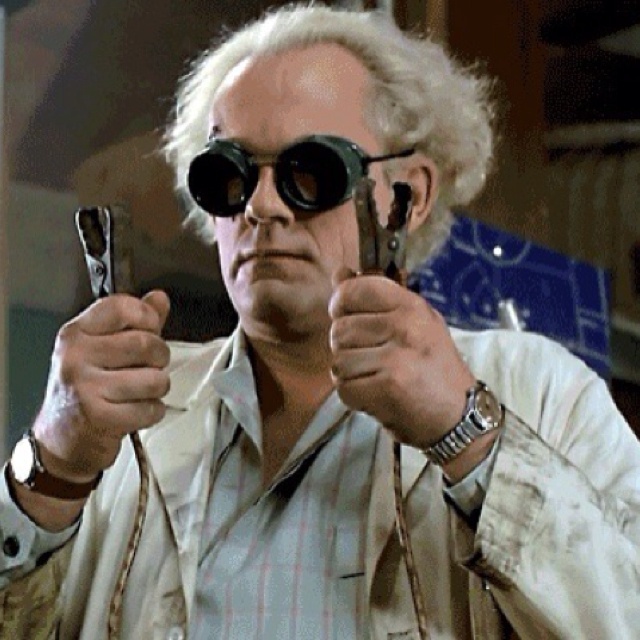 From there I started thinking about the character of Doctor Emérito Marrón (spanish rough translation for Doc Emmett Brown) as a dynamo obsessed with the flow of time, who tore down the time machine to try to understand it without success, giving the flying hoverboard to Martín Mc Mosca. As he couldn’t learn the secrets from the De Lorean, he hired a band of rag tag treasure-seeking junkies to help him finde more parts for his own projects. Work in progress. At times like this, I really like having a huge box of bits. Next week I’ll be showing more progress with Doctor Emérito Marrón. I hope next week’s post will arrive in time, but I won’t make any promisses just in case anything happens.